The moment of contact with the deck. Crowded Aft Flight Deck area. C-2 Greyhound with folded wings. C-2 Greyhound on the Flight Deck. Flight deck view from the Bridge. FA-18E on short final from aft deck. FA-18 Hornets on the catapult. FA-18 Hornet at the wire. FA-18 ready to taxi for launch. FA-18 on at the catapult. FA-18 Hornet line ready to taxi for launch. EA-6B Prowler waiting to launch. Hornet driver waiting to launch. Aft watch, this post is manned 24/7 to watch for a man overboard. This F/A-18 trapped and is still on the wire. These F/A-18's launced right after this photo. The tower and Vultures row. Navy pilots are that damn good. 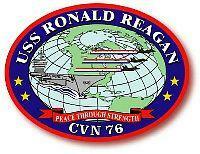 Click on the emblem to visit the USS Roald Reagan site.